“Those are lovely,” Kate said, pointing to a set of blue glass goblets in a store window. 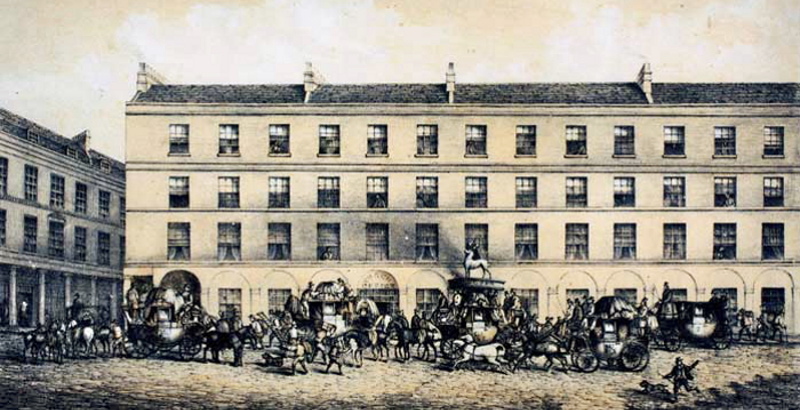 They strolled slowly along Milsom Street with little purpose other than inspecting shop fronts, the wares displayed, and the fashions of the patrons ranging from tasteful to outlandish. Grey clouds and a cool wind kept Earl and Countess Beaufort in, but Kate had ventured out, accompanied by her maid. Kate turned from the window and her gaze fell upon a man standing close by. Hugh Wansbrough, tall and lean, in a very dark blue tailcoat of fine wool with silk lapels, matching waistcoat and trousers, and highly shone black boots, carefully removed his shiny black top hat and stood still, staring at Kate. She took in his long wavy dark hair, fair complexion, and piercing light blue eyes. He grasped a thin book in one hand, his headdress in the other. “Mr. Wansbrough!” Kate declared, after only a moments hesitation. What a surprise! White Hart Inn, Stall Street, Bath, by J.C. Maggs (1819-96), built in the 1700s, demolished 1869. “You were admiring the glassware?” Hugh asked. Isabel, who had stood silently to one side, perfunctorily curtsied to Hugh. “How do you know about colours?” Kate asked. Kate laughed at his theatrics; Hugh beamed. Hugh rather meekly presented an arm. Kate’s first impulse was to take his elbow, but she turned away, pretending not to notice the offer. Don’t accept a man’s arm too willingly. And don’t smile too much. She knew her way to the shopping arcade and started along the pavement, letting Hugh have ample space on her street-side, while Isabel trailed. They each made some mundane comments about the weather, the heavy traffic, and the masses, and soon entered The Corridor, the shelter of the establishment quite welcome. Hugh sidled ahead in the crowd towards a bookshop. “This way, my lady,” he said with an encouraging smile. “My lady,” Miss Pierce responded plainly, then she swivelled towards Hugh, who had edged close during Kate’s instructions. For a moment Miss Pierce wide-eyed Hugh up and down, but then her heavy eyelids and lowered head hid her countenance. She glided away, Isabel following. “Who was that?” Hugh asked as he held the door of the bookshop open for Kate to enter. Hugh smirked slightly and looked askance at Kate; she stared back with a raised eyebrow, inviting comment. “Thank you,” Kate said softly, and felt her face growing warm, so she drifted towards the nearest counter, drawn to the garish covers of the penny papers. Wanting to appear sophisticated, she quickly moved on to a bookcase containing novels. She glanced sidelong at Hugh, peeking around the brim of her bonnet. He stood near a lamp, examining the map in his guidebook. Kate surreptitiously eased one of her waist-length braids into her line of sight, searching for a hint of red, but perceived only black. I need to be in sunlight. She let the rope of hair drop and concentrated on the books. Hugh started perusing the shelves, and fell in beside Kate. “Have you attended any balls since arriving in Bath?” he asked. “Truly? Hmm… now I’m in greater suspense. I’ll be curious to read how Blanche navigates the Battle of Brandywine.” This might be as entertaining as a penny serial! Kate studied the frontispiece, depicting men in uniform and colonial garb gathered conspiratorially around a candlelit table. “May I see?” Hugh asked with an open hand. Kate passed him the book, he scanned the illustration. “Let me get this for you, my lady.” Hugh spun on his heel and strode for the exchange and purchase counter. This casual and amusing delivery of a future possibility soothed Kate’s objection to his generosity. Perhaps he will visit me at home? I could show him Father’s library, and let him choose a book to keep. We could go for a gallop, and have tea. That would be nice. 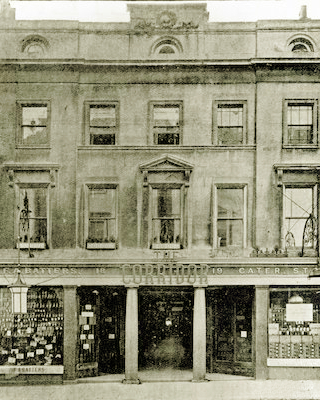 The Corridor shopping arcade, Bath, opened in 1825. This is the High Street entrance, photographed in the late 1800s. They left the bookshop and made their way slowly along the length of the shopping arcade, easing through the crowds, reaching the High Street doors. The maids were not yet present. A doorman let them out, and they stood patiently while several wicker Bath chairs trundled by, the elderly occupants wrapped in blankets, the attendants pushing the vehicles carefully, the wheels squeaking. They stepped away from the shadow of the building into a weak sunlight. Another awkward silence descended. “Are you in Bath for your health?” Kate asked. Hugh smiled, and Kate felt her face grow hot. She regretted her display of childlike enthusiasm and turned to hide her face with the brim of her bonnet. She knew to ask one question at a time, and wait for an answer, but had failed to do so. “You would!” Hugh’s eyes brightened. Hugh knitted his eyebrows, cocked his head, and frowned a moment. Kate realized from his reaction that she had confused him somehow. Still Hugh did not answer, a slight smile curving a corner of his lips. Kate felt a little irked. What? Hugh tried to control himself, guffawed, then laughed uproariously. Kate had to smile at his antics. “Astonishing,” Hugh murmured, his amusement replaced by shades of awe. Isabel and Miss Pierce emerged from The Corridor and approached Kate with small curtseys. “Well?” Kate asked of her maid. “We’ll all go,” Kate said, and looked to cross the street, dodging between the carriages. Hugh sprang to Kate’s side, crossing with her to the far pavement and walking around the open market place. “Perhaps I could talk with Lord Beaufort now?” Hugh suggested. 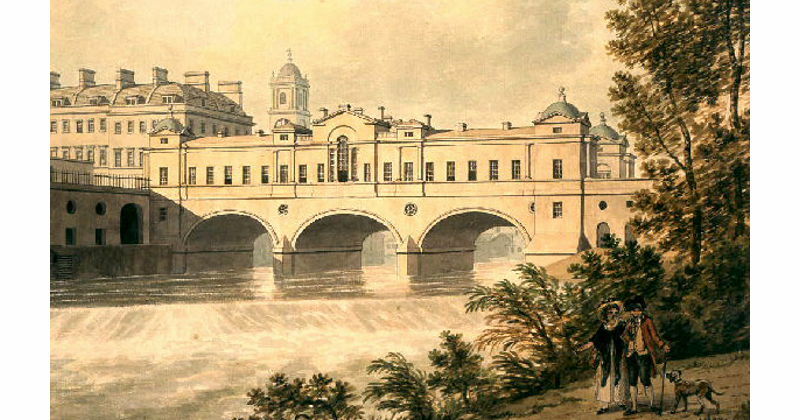 Pulteney Bridge, Bath, built 1774, depicted in the early 1800s. They stopped at the west end of Pulteney Bridge. “I’m a trifle nervous about seeing your father,” Hugh said lowly. “Until tomorrow, then.” He gave Kate one of his calling cards. “You’re very welcome, my lady.” Hugh removed his hat and bowed. Kate curtsied, then stepped between the maids and started across the bridge. “What? !” Kate was shocked. She halted, spun, and stared at Hugh’s retreating form. “And he knows you,” Isabel added. “Does his suit appear black from a distance?” Miss Pierce asked rhetorically. “It does,” Isabel answered needlessly. Kate remained silent, and resumed walking towards their lodgings. I don’t believe it. Hugh wouldn’t have stalked us. She absent-mindedly fiddled with with a braid of her hair, tapping it on the novel. His suit did look black… hmm… but this sunlight is weak. Yes, on a bright day, like our afternoon in Sydney Gardens, his suit would have shown blue. Kate glanced down at her braid. It’s definitely the weak light, my hair looks black too! Thank you for your nice story of Kate’s arrival and encounter at Bath. I look forward to your next installment. You’re welcome, Michael. Thanks very much for your ongoing kind comments.